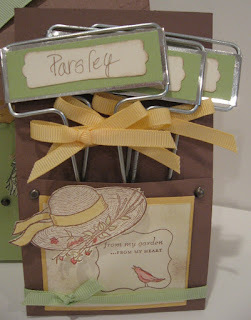 Welcome to Day #2 of our RemARKable Open House Blog Tour –you are going to wowed by the creativity and imagination of my fellow team members.Each RemARKable on this tour is offering the same class to their customers that includes the HOUSE PDF/Pattern, and an IDEA sheet with a total of 30 house ideas on it. As one of my customers if you have not yet registered for the class, my class is being held on FEB. 19 or 20. Click on my class schedule to the right to view the details. To view the house we will make in the class, look at my post for Jan. 29. In my Garden Shed are some fun things! 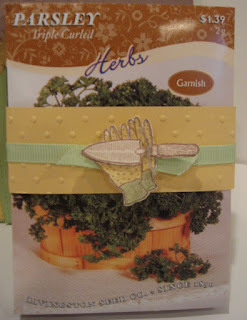 Today's post show's a way to package seed packets to look all cute! When the seeds are planted you will need plant markers so you remember what you planted! Aren't these adorable? Be sure to check back tomorrow and see what else is in my shed.